"This monster... This is no Unversed. Just a dweller of Darkness." 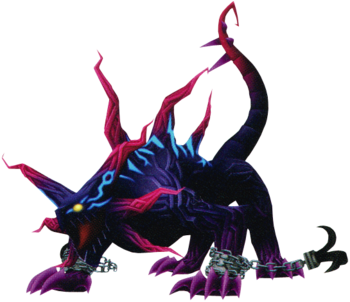 The Dark Hide is a Pureblood Heartless that is found in Kingdom Hearts Birth by Sleep Final Mix. It is the boss of the Secret Episode in the Realm of Darkness. The Dark Hide is a massive creature that resembles the Dark Thorn. It has a dark purple and black body with dark magenta spikes running down its back, as well as a "mane" of dark magenta tentacles around its head. Its tail has a dark magenta tip, and the Heartless sports four purple claws on each of its four legs. The most distinctive feature of the Dark Hide is its yellow eyes, which occasionally glow red. The Heartless also sports a jagged mouth, blue markings on its face and body, and chains around its forelegs. Its body is rather long and thin and, despite its massive size, the Heartless moves quite quickly. The Heartless is able to cloak itself in darkness, obscuring all of its features, save for its eyes, which glow bright red. It seems to be able to use its eyes to zoom in on the objects it looks at; from its perspective, everything has a very faint red tint. Glowing red veins are present around the sides of the Dark Hide's field of vision. The Heartless frequently creates disorienting after-images of itself as it moves, including red, green, and purple versions of itself. While making her way through the Valley of the Dark in an attempt to return home, Aqua is stalked by the Dark Hide. Aqua detects the Heartless's presence, and the Master's Defender appears in her hand. The Dark Hide attacks Aqua from behind, knocking her down, but the young Keyblade Master quickly retaliates with a Firaga spell. This forces the Dark Hide to flee back into the shadows; Aqua can only see its glowing red eyes. Aqua realizes that her attacker is not an Unversed, and like the creatures she has faced in the Realm of Darkness thus far, it is one of the realm's denizens. Aqua engages the Dark Hide in battle, emerging victorious after a strenuous showdown. Claw Swipes: swipes Aqua quickly with its claws. Tail Whip: spins around, hitting Aqua with its tail. Buzz Saw: performs a damaging midair flip. Fire Charge: emerges from the shadows and charges at Aqua, leaving a trail of flames in its wake. Shadow Bomb: shoots orbs of dark energy which, after a few seconds, expand into damaging force-fields. Mega Flare: shoots a large fireball at Aqua. Illusion Spin: spins at high speeds around the outskirts of the battlefield, using four of its after-images to charge at Aqua, before pouncing from above and into the center of the area, creating a damaging shockwave. Illusion Slash: Each of the Dark Hide's afterimages attack Aqua with their claws. The Dark Hide is a fast, fierce, and unpredictable opponent. In the first phase of the battle, the Heartless attacks from within the darkness, visible only by its glowing red eyes. It will attempt to charge at Aqua, and when it does the battle shifts to its point of view, making it hard to dodge. It also attacks with claw swipes and tail spins. The best way to deal damage to the Dark Hide in this phase is to wait until just after the scene where it looks at Aqua through its point of view, then quickly use Barrier to block the attack and use Aqua's counterattack to deal damage. The Dark Hide will then stand idly for a few seconds before returning to the shadows, so be sure to get as many Keyblade strikes in as possible. If Teleport is equipped, Aqua will sometimes teleport behind the Dark Hide instead of blocking its attack with Barrier. This leaves the Heartless vulnerable as all of its attacks are focused on what's in front of it. After losing one and a half health bars, it will reveal its true form, starting the next phase of the fight. The second stage of the battle is the same as the first, with the exception of the new attacks in the boss's arsenal. Dark Hide still retains its claw swipes and spin attacks, but can now charge at Aqua, leaving a trail of flames in its wake. Also, the Dark Hide's movements become more erratic, making it hard to land hits. The Rhythm Mixer Command Style finisher deals great damage to the boss. After another round of combat, the Heartless unveils the rest of its attacks. In the final stage of the fight, the Dark Hide now uses red, blue, and green afterimages of itself for offensive and defensive purposes. It may spin around Aqua, its afterimages charging at her while it slams the ground, creating a shockwave. Dark Hide can also shoot dark energy orbs that expand after a few seconds, damaging Aqua if she steps to close. It also utilizes a variant of Mega Flare, wherein it shoots a large fireball at Aqua. Be sure to heal when necessary. The Dark Hide stalks Aqua in the Realm of Darkness. The Dark Hide reveals itself to Aqua. This page was last edited on 3 April 2019, at 17:09.